Spencer Lazar is a partner at General Catalyst. We take it for granted, but insurance is an incredible financial instrument for consumers and businesses: give a small and steady stream of payments today to avoid getting stuck with catastrophic payment(s) in the future. Whether medical, automotive, life, residential, or commercial, the value proposition of smoothing out potential cash flow outlays often makes sense. Pretty cool. 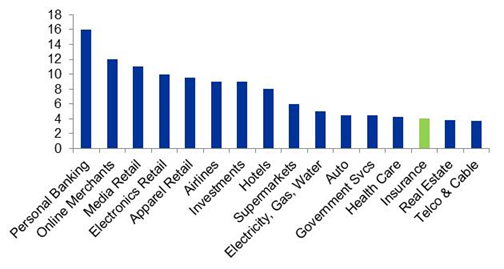 But on any chart highlighting relative customer satisfaction across industries, you will consistently find that insurance ranks among the last — only ahead of real estate, telcos and cable companies. At a time when nearly every product category has been reimagined by a higher quality digital successor — the insurance industry and customer have been left in the dust. 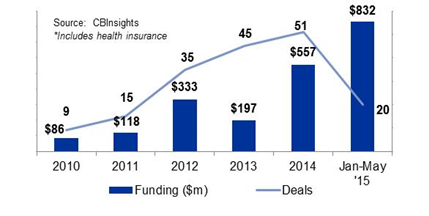 But the amount of chatter and activity surrounding insurance in the venture world is growing. Insurance firms with corporate venture arms are signaling need for innovation within their model. Axa, Assurant, Munich Re, and AmFam are just a few examples of firms opting to learn and participate in the disruption as opposed to sitting on the sidelines. We now have a few proof points in the industry. Instead of delivering software tools and analytics to enhance the legacy value chain, businesses like GC-backed Oscar and SF startup Clover Health have decided to wipe the slate clean and start fresh. The industry is that broken. Friends at other venture firms are talking about the emerging opportunities. Brendan Dickinson at Canaan drew parallels to the explosion in recent non-bank lending investing activity and the opportunity to overcome what previously seemed like insurmountable regulatory barriers. Frank Chen at Andreessen highlighted new applications for software across the value chain — from pricing risk to engaging customers and pooling capital. And Lee Hower of NextView ventures called out the startling innovation gap between most developed countries (where 40–50% of insurance is bought or managed over the internet) versus the U.S. (with less than 5% online). Venture money is now going into the industry, where it used to be barren. Aggregate VC funding in insurance over the past 5 years tops $2B, but was already at ~$800M in just the first half of 2015 alone. The venture world is always in search for the next big market opportunity, of which insurance is certainly one. Insurance represents more than $1.3T in premiums in the U.S. alone. That’s bigger than the the amount of money spent annually on online travel (~$160B) + household work (~$460B) + food delivery (~$600B) — combined. The industry is also really old. There are 46 insurance companies in the Fortune 500, with an average age of around 95 years. We’re talking pre-internet, and it shows. The industry’s entire organizational structure was designed for an antiquated, Mad Men era buying experience. And, these incumbents are pervasive. Collectively, insurance companies employ more than 2m people and spend billions of dollars annually on marketing. You can’t watch an hour of television without getting interrupted by a little lizard, caveman in tennis whites, or quacking duck. It’s everywhere. But the customer experience with these companies — whether in life, home/renters, or commercial — has largely stayed the same. Insurance has been insulated from the disruption impacting other sectors like travel, due to complex regulatory requirements, inherent channel conflict between carriers & brokers, and the opaque nature of data used to assess risk. Like so many other industries, it’s time to move on — and to accept the opportunities, unknowns, and challenges that come with a scaled digital population. Timing is everything and the industry is finally on the brink of transformative change, driven by strong secular trends. The world is online and connected — creating new distribution channels but also new risk (e.g., cybersecurity). Additionally, explosion of the shared economy and 1099 workers has created fractional ownership — and with it, uncertainty around who bears the risk. And in that digital world, we generate digital exhaust, which can be used to better personalize policies and underwrite risk. Increasingly, consumers are wearing FitBits to track wellness data, installing Canary for home security, or sharing lifestyle behavior on social media. Imagine tracking your driving data in real-time, making dynamic changes to policy premiums, and receiving an instant claim reimbursement for that fender bender — all with just a few taps on your mobile phone. Crucially, the regulatory climate is also changing. Historically, success has required huge capital reserves as well as navigating 50 state-by-state regulators with unique laws around underwriting, pricing and distribution. This structure has stalled innovation, protected incumbents and imposed tremendous costs. Now, Washington is beginning to call for more simple and consistent requirements across state and federal levels. Emerging structures have the potential to lower capital reserve hurdles or change the way capital is pooled. And the U.S. insurance industry is facing increasing pressure to adopt international regulatory standards that encourage consumer protection and price transparency. All of these policies should lower barriers to entry, level the playing field and create opportunities for new entrants to innovate. The world is changing. If you look at Oscar, SoFi, Lending Club, these are categories of financial services that nobody thought would be reinvented by a startup. But we live in a post-2008 financial crisis, JOBS act, and peer-to-peer lending world. Now, more than ever before, entrepreneurs are ready and able to take on the Mega Fortune 500 companies. Despite the complexity of products, the insurance business model is rather simple, relying on policy premium income and asset management. I’m focused here on the operating side of insurance, and see opportunities for innovation across the value chain. Importantly, while each step of the value chain is consistent across the industry (as outlined below), the ability to fundamentally change process and drive margin will vary wildly by insurance vertical (e.g., life, auto, health). I’m focused on 3 investment theses that I’ll dig into deeper in subsequent posts. Online Aggregators & Brokers. The first mirrors GC’s experience with Kayak and trying to bring best of breed user experience to online aggregation / shopping. Through smart user experience, information transparency, and digital concierge-like services — it’s possible to make informed decisions (that once seemed so complicated they required a human) and fully transact online. Success of companies like Check24 in Germany highlight how far behind the U.S. is, and underscore the size of the opportunity. New Direct to Consumer Brands. The second leverages GC’s experience building DTC brands, such as Warby Parker and Oscar. Fully digital players in Homeowners/Renters and Life Insurance will increasingly displace existing carriers, by re-positioning products and engaging consumers directly. New Models. I’ll challenge some of the fundamental assumptions we’ve made about types of products that require coverage and how business models are structured. Drawing from experience with transformative models like Digit, FundBox, and RealtyShares, I’ll explore models like peer-to-peer (e.g., Guevara) and pay-as-you-go (e.g., MetroMile) that are more nimble and flexible. It has been exciting to see the energy that’s being poured into the insurance sector from engineers, data scientists, and early stage investors. GC has been active in the space for a couple of years, leading early investments in Oscar (health insurance), Censio (driver analytics for improved underwriting), and Super (home warrantee). As I look at GC’s work with next generation DTC brands (Warby Parker, Honest Co) and disruptive financial services (FundBox, Stripe, RealtyShares), I’m confident that entrepreneurs can deliver new levels of service and transparency in insurance. I’m excited to make a number of more bets in the category — and even more excited for the value to be unlocked in the ecosystem. Thanks to Whitney Arthofer, Prateek Alsi, and Molly Gillis for your help exploring this space and with this post.